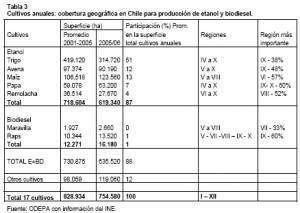 A Sustainable Biofuels Policy for Chile? I scribbled some notes on this story when the report was first released in late January. But when I could not get back to finishing and publishing it right away, I thought about just dropping it because I half-expected President Bachelet to act on it quickly. Instead she appears to be holding off, digesting it and weighing the options, not allowing herself to be rushed. So maybe prudence is prevailing after all? Shortly after the German firm Südzucker announced in October its interest in making a massive investment in biofuel production in Chile if the regulations and policy were adjusted, the Government created a public-private commission in order to develop a national biofuels policy for Presidential consideration. The commission was originally slated to deliver a report by year-end so that the President could draft a biofuels law by end-January 2007. Given the Government’s apparent haste to slap together a report and draft law — plus public statements by the Agriculture Minister extolling Chile’s potential to be a biofuels power, and press reports of German Government pressure on Chile to adopt a regime favorable to investments like that proposed by Südzucker — I expected an unbalanced report proclaiming biofuels’ benefits for Chile and playing down its possible shortcomings or pitfalls. When the Office of Agrarian Studies and Policies (ODEPA) was assigned to coordinate the commission’s work, my fears appeared confirmed. ODEPA reports to the Agriculture Ministry, in the recent past an outspoken proponent of biofuels development. Instead the resulting report released in late January is a pleasant surprise: one of the most most cautious, thoughtful and nuanced discussions of the biofuels option I have seen from a nation in Latin America and the Caribbean (LAC). For one thing, it points out that what works for Brazil and perhaps for other tropical nations will not necessarily work well for Chile. For another, it admits that even in the best scenario domestically-produced biofuels could only provide a small portion of Chile’s projected energy needs, and at that, would probably need world prices for a barrel of oil to hover around US$72 in order for domestic biofuels to be price-competitive. Chile might consider importing biofuels from neighboring nations instead, with Argentina, Bolivia, Brazil and Peru mentioned as possibilities. 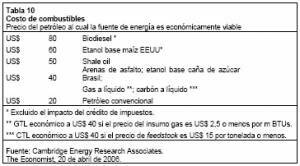 mandatory offer for sale of biofuels regardless of the international price of petroleum. In particular, a 2% mixture should be required for biodiesel, with 1.5% annual increases in the mixture. Fourth, at nearly every step the report points out that there are serious trade-offs necessary if Chile is to seriously pursue biofuels production. Will Chile be able to remain able to feed itself? Would it still remain a major crop exporter? What would be the impact on Chile’s sensitive water supply? Would biofuels production harm Chile’s substantial rural, small-farmer communities? Fifth, the report insists on avoiding the temptation to pin hopes for the viability of biofuels production on the use of transgenic crops. 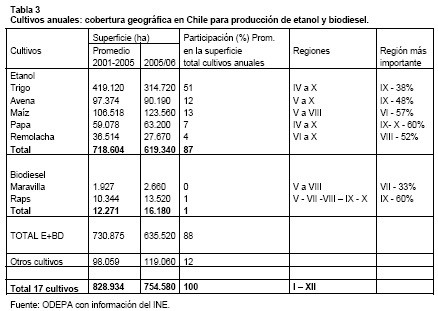 Chile still does not have a national policy on the transgenic crops intended for domestic sale, so their use should not be factored into any calculation of cost/benefit of biofuels, the report insists. The cost/benefit analysis should only factor in use of conventional crops. Sixth, the report is also the first I have seen in LAC that warns that any biofuels regime must be carefully crafted in order not to fall afoul of rules in the World Trade Organization’s (WTO) Subsidies and Countervailing Measures Agreement (SCM). All too often LAC nations formulate policies without taking into account whether their international obligations can result in trade dispute cases undoing all that they have constructed. the biofuels policy should be complementary to the national strategies for food security and turning Chile into a world Agro-Food Power. the biofuels policy should ensure that the development of inputs does not adversely affect the use of soil and water resources for agricultural production for both internal consumption and for export. In particular, the Water Code should be modified in order to prevent “water stress” by increasing efficiency while cutting contamination. the biofuels policy should be designed so as to ensure that it does not lead to concentrating ownership of the new industry in few hands. In other words, it should guarantee the inclusive participation of all actors in the value chain, from seed to consumer (workers, producers, transporters, processors, vendors and consumers. The tax treatment of the chain should help small farmers. Contract agriculture should be formally standardized and regulated, since so much of current production of the crops most probable for use in biofuels production utilize this modality. 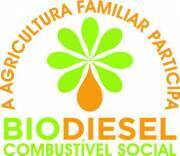 Chile should adopt a “social seal,” such as Brazil has for biodiesel producer that buy their primary materials from small agricultural producers, or such as Argentina’s. Research should be promoted by the government into the development of biofuels fitting national realities. It is suggested that some of the funds resulting from the mining royalty be allocated to such research under the direction of the Commission on Scientific and Technological Innovation (Comisión Nacional de Investigación Científica y Tecnológica – Conicyt). 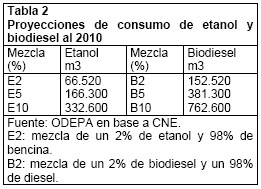 All industrial biofuel projects should be subjected to the Environmental Impact Assessment System (Sistema de Evaluacion de Impacto Ambiental – SEIA), particularly with a view to identifying any benefits they have over traditional hydrocarbon fuels and quantifying the reduction in air pollution they offer. The government should look into the feasibility of selling carbon credits for substituting fossil fuels with biofuels. Chile should adopt technical quality norms and a regulatory framework that is neutral with respect to the various technology alternatives available. It is suggested modeling the quality norm after Germany’s. The Health Ministry should create a system of permits and certifications regarding the disposition of used oils and apply sanctions in order to ensure that they are not reused for human consumption. Thought needs to be put into the logistical and distribution infrastructure needed to make biofuel consumption a success. To her credit, President Bachelet did not immediately pounce on the report, pronounce biofuels to be Chile’s energy salvation, and quickly release an already drafted biofuels bill. Given the “biofuel fever” that has been sweeping LAC lately, and the pressure on this issue she has been getting from certain quarters, it would not have been a surprise if she had. As the report suggests, a heavy national commitment to domestic biofuels production doesn’t make (economic, social, environmental) sense for every nation. Just because Brazil has made a success of it — after decades of investment, R&D, policy focus, tax breaks and subsidies — does not mean other nations can do likewise, and certainly not in a hurry. Its costs and benefits should not be weighed solely in terms of imported energy it cuts, or its alleged carbon footprint or air pollution reduction — all important issues to consider, granted! But they should not be analyzed in a vacuum, omitting any consideration of what a high-priority domestic biofuels production program might do to things like food security, water supply and even the impact on small farmers, if maintaining or promoting strong rural communities is a national priority. A biofuels focus will involve trade-offs, and these should be fully identified, openly discussed and an informed choice made based on the resulting assessment of relative national priorities. That said, the Bachelet Administration is feeling the pressure to “do something” about Chile’s dependence on imported energy. Chile has always depended heavily on imported oil, and now feels that vulnerability even more acutely with Argentina cutting its natural gas exports to Chile, the global price of oil so high, and projections of the country’s energy demand needs projected at rising 50% by 2030. Hence the newfound Chilean interest in energy efficiency, promoting renewable energy sources (primarily wind and geothermal), tapping biogas and yes, even toying with the idea of nuclear power. In this context it seems very likely that Chile will go ahead with some sort of biofuels program, even if at best it is only projected to take care of 5% of projected energy demand. The question then becomes just how far Chile will go to get the perceived biofuel benefits, and what it is willing to trade off to achieve them.